A couple of weeks ago I finally accepted that I needed to reorganize my nail polish stash. 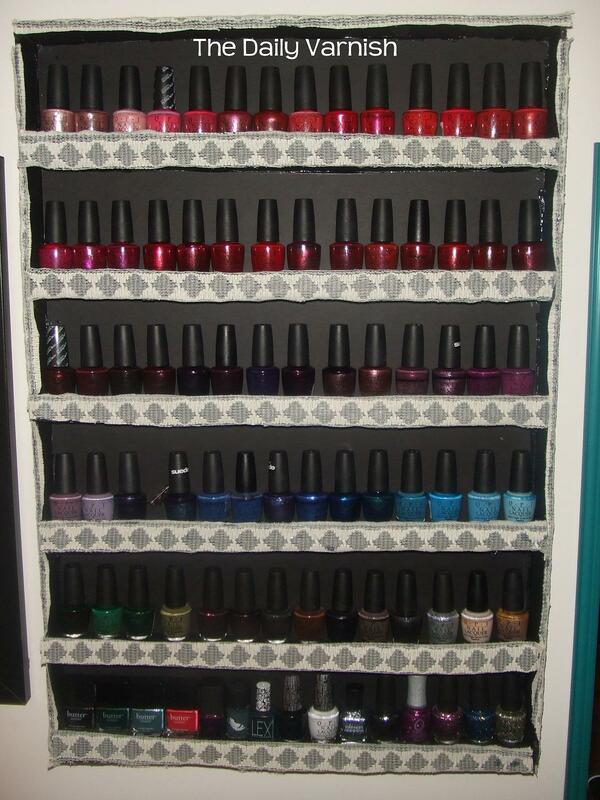 I use 2 Melmers and a DIY nail polish rack to store my polish and it is a wonderful system…if I actually use it! I made the terrible mistake of reorganizing my stash by brand (instead of color). Since then I’ve had a hard time finding what I was looking for and nail polish ended up everywhere. There were bottles on my desk, on my nightstand, on top of my lightbox, in my bathroom, on my vanity, on top of my dresser. Even in my car and in my purse! Quite frankly the situation was out of control and nail polish was taking over my life. It has been a slow process but I’m getting close to having all my polishes entered in my new nail polish spreadsheet. Currently my sewing machine is covered with nail polish bottles as I’m waiting to have everything archived before I reorganize my Melmers by color. This was all a very long winded way of explaining why I’ve been doing some research on how to properly store nail polish. My collection is far too large for most of my polishes to get any kind of regular use. So I want them to last me a long time. I’ve gone through several nail polish storage methods. The first being plain old plastic containers. The second was a Melmer that lived on my vanity. Then I expanded to 2 Melmers and moved them into the linen closet in my bathroom. Turns out….these were all really bad ways to store nail polish! The best place to store nail polish is in a cool, dry, dark place where the bottles can stand upright. Unfortunately, this eliminates many of the most common places to store nail polish. Clear plastic containers expose polish to light and don’t allow for polishes to easily stay upright. Storing polish anywhere in the bathroom exposes the polishes to humidity. What’s a girl to do? I definitely will not be ditching my nail polish rack, but I will turn it into a non permanent means of storage. It will be a place for polishes I plan to wear soon and then they will move on to my Melmers. Luckily, my Melmers (as long as I keep them out of the bathroom and direct sunlight…) are a great place to store polish. But, there are other places that would work too. The bottom drawer of a dresser, desk or vanity. At the bottom of a closet (preferably with no outside walls) in just a shoe box would also work well. I’m glad to know that I’m giving my polish its best chance to last a very long time. I hope this was somewhat helpful and hopefully in the next couple weeks I’ll be sharing my new storage and organization method with y’all. I keep mine in an old wooden secretary desk… My to-read books are in the top, polish is in the drawers. I use a combination of silverware trays and desk organizers to keep the colors separated/organized. I doubt it’s a perfect system, but it works for me. I am convinced there is no such thing as a perfect system. As long as it works for you that is all that matters! The nail polish rack looks very professional, i like it. I so wish I had a space for melmers but I am in a cracker box of a cottage that only has 2 drawers in the kitchen even…so space is really hard to come by here. 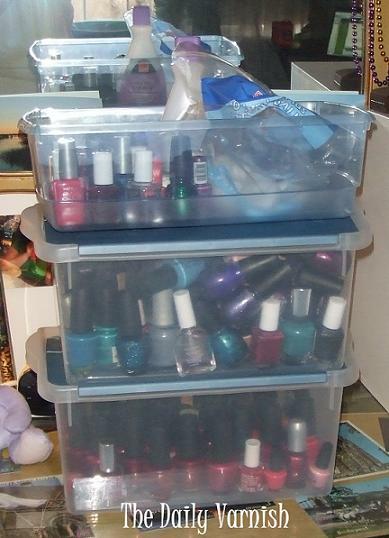 I have had to keep my polishes in plastic storage boxes. I used to find some good ones by Rubbermaid that had hinged tops so they were all 1 unit with box and lid and the lid had a big head space that allowed me to deal with tall bottles as well. Now those are not made and I have to use the standard shoe box size ones. I keep swearing I am going to get to my dupes that now take up more than 4 large boxes and get them out of here but for the 4 or 5 that I want to keep for me. I do store mine out of all sunlight. But like you, I am guilty of having a few key polishes out – I keep a tiny spot on a cabinet in my bedroom where I can put my top clear coat, base and the 2 main shades that I am reaching for constantly. I do keep a database of all my polishes but when I get lazy on entry, I toss the ones that still need to go into my database in a gallon size ziplock bag and then get to them in bulk. Ya think 1500 bottles in my database are too many! I finally do! That sounds so cool! I’d love to see a picture! thanks so much for this. I almost went the way of storing in the fridge. I keep mine in 2 photo boxes I got from a craft store. Its great as it’s dark and dry but I am running out of room as to my growing addiction so i need to buy more. How much do melmers run? Great post! I keep mine in a melmer inside my closet. I really need to organize them though; right now they’re in total chaos! I guess my acrylic drawers inside an ikea pax wardrobe is the best way! Sounds like a perfect way to store polish! I use old Birchbox Man boxes from my bf to store them by colors (one box for golds/silvers, one for blues/greens, one for reds, etc.) they’re a really cute and sturdy pull-out design. But it sounds like I’m doing it wrong! Why is it bad to store bottles on their side instead of upright? It has to do with the way the pigments are mixed plus if a bottle is on its side there is a larger surface area exposed to air. Hopefully that makes sense! I have mine stored in two Melmers that I stacked on top of each other. I also put a set of wheels on the bottom so I can roll it over to my bed and it’s perfect nail polishing height. I never thought about putting wheels on the bottom of my Melmers. What a great idea! Thanks! I actually came up with it when I was picking up my second Melmer. Just to give you a heads up, you’ll have to remove one of the front pieces on the wheel set in order to have access to all of the drawers. I really did LOL at the sewing machine comment, as I had a significant portion of my collection stacked in copy paper box lids that I was using as trays. A couple of weekends ago I did some mass production of the DIY racks. I currently have 8 in an interior hallway (no direct sunlight). They are narrow enough that I can use this under utilized space for storage *and* decor. I probably only need 7 but I want some room for the inevitable growth. I recently got into gels (LOVE!) and those are stored in an opaque rolling cart (sunlight will cure/harden them in the bottle) along with my supplies like files, base and top coat. The rolling cart stays by my desk, but I can roll it in front of the couch for the TV-dry time combo. The top is big enough to work on and all of my supplies are at my fingertips–I just have to decide on a color first! P.S. from my mass production I discovered a trick to getting the foam board to glue together straight/level: I used plain, old-school straight pins to hold the boards in place and then did the hot glue. No burnt fingers either! Hey I’m a near-newbie at this but already have about 60 or so polishes, obviously too many to use up in the next 5 or 10 years, lol! So, is humidity a real problem? Sigh, new problem! As long as you keep the door closed I think it would be fine. I used to keep my polish in the linen closet that’s in my bathroom. I never felt like the humidity really got in there. Tks, I doubt this cupboard is well sealed, but for now I’m going to leave it and hope for the best. Just no space elsewhere! I dont wear mine as often as i want but as soon as it chips i get annoyed. Lol but anyway. I do keep my bottles in a little drawer in my dresser in my bedroom, but, its on the outside wall that the pipes freeze on all winter. Never thought it would damage them. Thank you for making me aware! !!! That was big help! Cuz we storing polish in frig! Thanks soo Much!! !